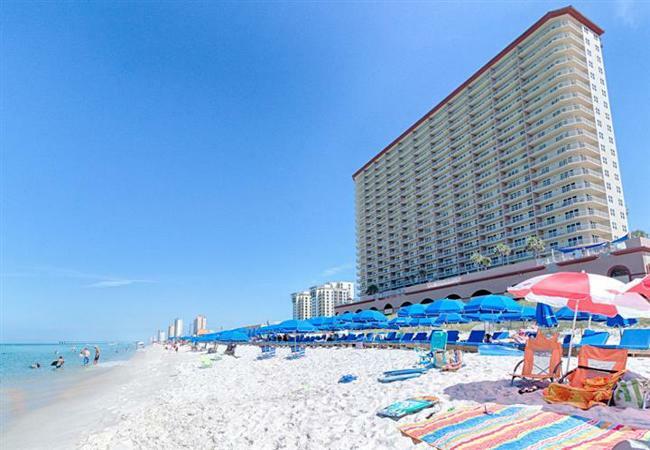 Feel a world away but be in the heart of everything when staying at Panama City Beach’s premier vacation destination, Sunrise Beach Resort condominiums, where the possibilities are as a limitless as your imagination; as endless as the ripples on the Gulf of Mexico right outside your vacation rental. Located directly on the Gulf of Mexico, this Resort Condominiums highlight an elevated gulf-front deck with two tropical pools (one seasonally heated), relaxing spas and children’s water play area. Featuring one and two bedroom units with bunk room and incredible three bedroom end units. All units have huge balconies and master bedrooms directly on the Gulf, full-size kitchens, washers/dryers, and marble baths; some units include jetted tubs. Guests looking for a oceanfront, kid-friendly resort will find this Resort in Panama City’s West area, the perfect combination of convenience and comfort. Sunrise Beach Resort also offers parking underground instead of across the street, which guests find very convenient. Some resort extras include two outdoor gas barbecue grills, complimentary high-speed Internet, and a beautiful clubhouse available to rent for wedding receptions and parties. Beach chairs, umbrellas and many water sports/activities all await your arrival on the beautiful white sand of one of the world’s most beautiful beaches. Another big plus is the first class fitness center, also facing the Gulf, affording you the same beautiful ocean view you would have if you were sitting in a beach chair instead of working out! Whether you are exercising, relaxing on the beach, splashing in the pool, or watching the dolphins play from your balcony, this resort has it all! These Condominiums give guests one of the best oceanfront values in PCB, Florida.